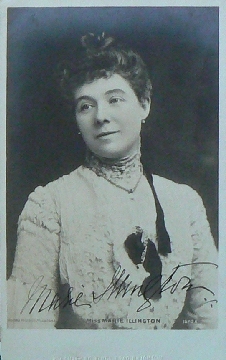 The actress Marie Illington was a celebrated stage actress in England. She was born into a well sheltered domestic home and her parents supported her artistic efforts. Her father was the owner of a well-known restaurant and her mother was a popular ballad singer under the pen name Fanny Stirling. She made her stage debut at the age of 17 in 1875 at the Haymarket Theatre where she appeared in a comedy, afterwards she was engaged for the recently opened Theatre Royal Edinboro where she played the next years. She soon became an acclaimed stage actress. Despite her successes at the theater she was not entirely disaffected by the film business although her appearances in front of the camera remained seldom. She made her film debut in 1916 with "The Vicar of Wakefield" (16) with John Hare and Ben Webster. At the beginning of the 20s followed her last cinematical works with "The Headmaster" (21) with Cyril Maude and "Fires of Innocence" (22) with Joan Morgan and Bobby Andrews.